Council and University representatives have begun talks on how revamping the disused Reading Prison could inject new cultural life into the town centre. Architects and archaeologists were among the experts from the University of Reading who met leaders and town planners from Reading Borough Council last week, along with the site's owners, the Ministry of Justice, and other representatives. 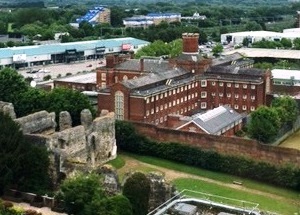 The group visited the Victorian prison before meeting in the offices of planning and design company Barton Willmore at the Blade, overlooking the site. They discussed a potential vision for development, which could include housing and space for business, leisure and cultural education. Professor Lorraine Farrelly, head of architecture at the University of Reading, said: "The prison and surrounding ruins of Reading Abbey are of enormous cultural and historic significance, not just for Reading but internationally. "We need to take an integrated approach to keep the historical character of the site while identifying appropriate new uses for the prison buildings. "This is a unique opportunity to create a new town centre community for Reading with a rich historic identity, complementing the plans for the surrounding heritage quarter." Participants considered the unique character and history of the site, challenges and physical constraints, a vision for Reading informed by the past, present and future contexts, and various possibilities for the transformation of the site. Cllr Tony Page, Deputy Leader of Reading Borough Council and lead for strategic environment, planning and transport, said: "My thanks go to the University and other participants in seeking to gain the views and suggestions from a wide cross section of interested parties including the Council. "I hope that the key outcomes will be considered carefully by the Ministry of Justice and form part of the agreed development brief for the site. Reading Borough Council is fully committed to securing the very best future for this internationally important historic and culturally valuable site. We look forward to working with the Ministry of Justice in finding a development partner who can truly make our shared vision a reality." John Haxworth, director of Barton Willmore, which hosted the event, said: "Opportunities to reshape a historic town centre site don't come along often. When they do, we owe it to the future of Reading to find the best possible solutions. "We are delighted to be helping to bring some of the brightest minds together so that all aspects are considered in drawing up the plans." Reading Prison has been an important part of the identity and history of the town since it was built in 1844. The site itself is of importance as it sits on a site of exceptional archaeological interest - Reading Abbey - which is dated 1121. A decision was made by the Ministry of Justice in 2013 that the prison was no longer fit for purpose. The opportunity for the future of the prison is an important issue for the development of a key area, the heritage quarter within Reading. The site falls within the emerging ‘Abbey Quarter Area', an area that Reading Borough Council and its partners are actively developing and promoting for its historical importance and as an important leisure, learning and interpretation visitor attraction for the future. The development of the prison site will extend the area of the Quarter and provide various additional attractions complementing the other attractions of the area.